Since Dubai Water Canal opened in 2017, it also came with a few interesting new pedestrian bridges. The most attractive one is the "Bridge of Tolerance" which frames the modern part of Dubai well in the background like can be seen in the image I shot more than a year ago, here. Unfortunately there are presently quite few cranes spoiling the view, which limits taking more detailed shots. 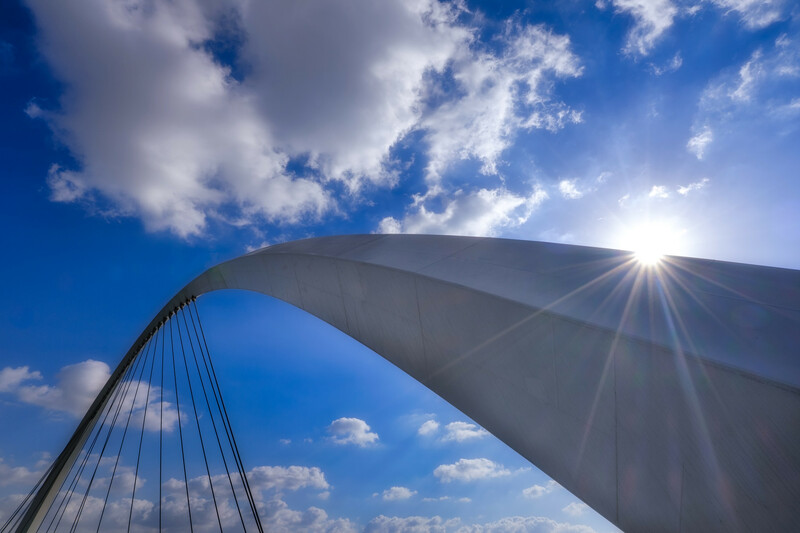 While testing the new super wide angle XF 8-16 f2.8 lens, I shot the image below as the sun was just peaking along the bridge. A perfect opportunity to test the "sun burst" effect of the lens. Sun burst effect is best done when the sun borders a hard edge and shot at a wide aperture, minimum f16. My review of this great piece of glass can be found here.